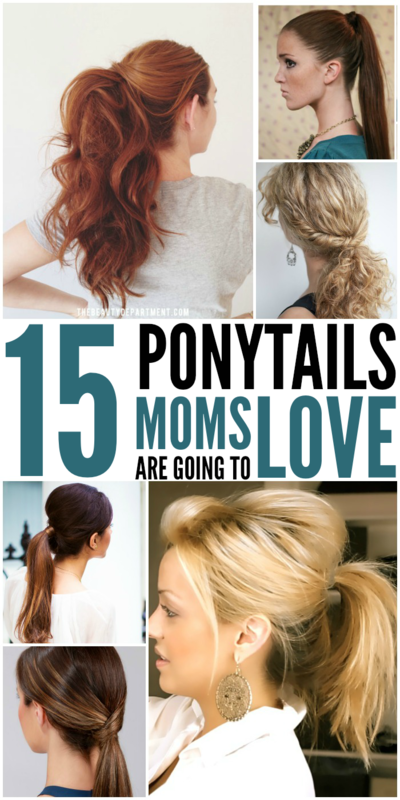 Looking for cute ponytails to try?? Moms usually don’t have time for fussy hairstyles, by the time you get the kids up and out the door you’ve barely had time to brush your teeth and put on mascara, right? 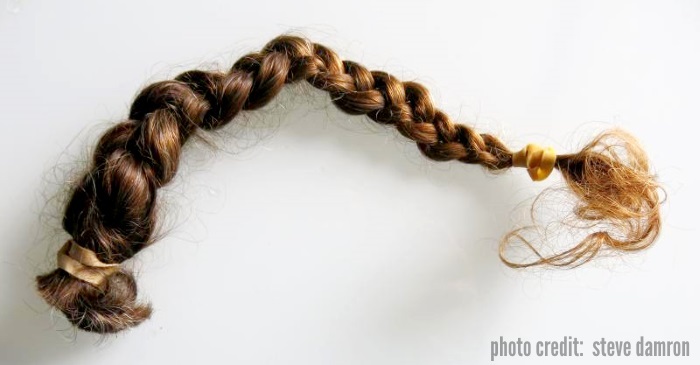 Our recent post on EASY Mom Hair Styles went bonkers – as did hair hacks your locks need. When you’ve only got minutes to get yourself ready and out the door, choose cute and quick – and upscale your ponytail in seconds! Want a long, full ponytail but don’t quite have the length for it? 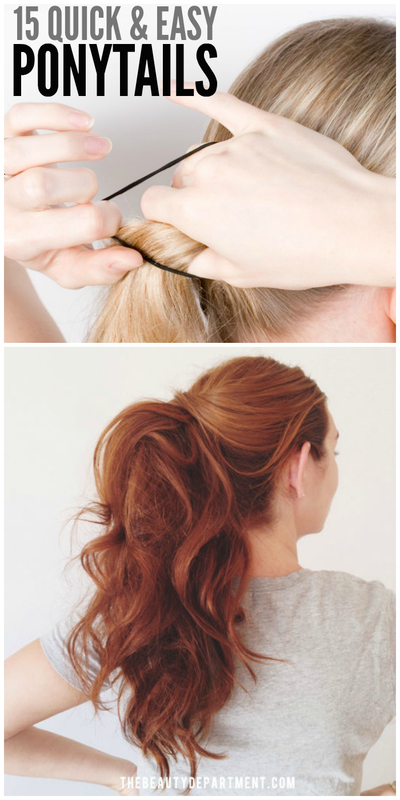 This two-ponytail hack will save the day! 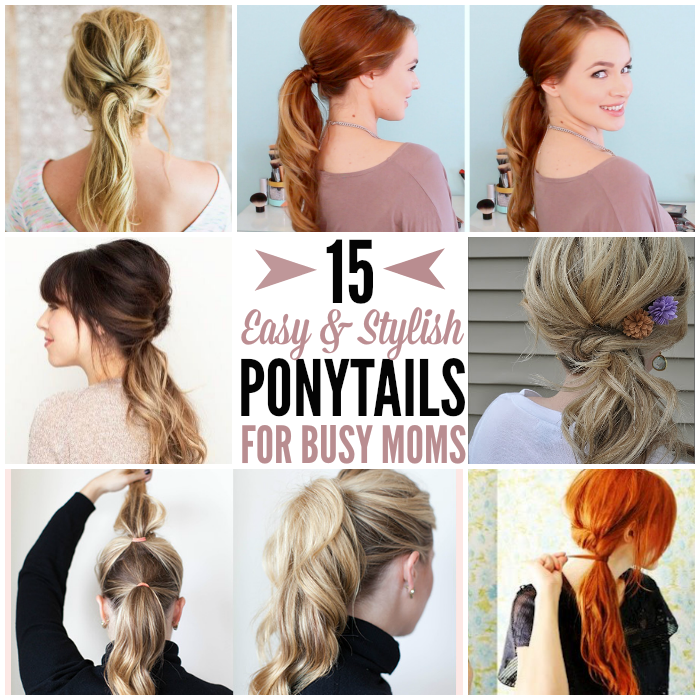 Place one ponytail near the top of the head and another near the bottom, fluff them up, and you’re good to go. If you’re rocking long, thick hair this big ponytail is just what you need! Add a little curl for texture, tease it a little, pull it up, and POW! You know those side ponytails you loved as a kid? For the most part, we’ve outgrown them, right? Think again. Here’s a grown-up version that looks soft and romantic. This straight and tight ponytail will actually give you a sleeker look. Blow dry with a flat brush, and run a straightener over your hair once it’s up in the ponytail. This polished low ponytail is a great look for the office. Pull most of the hair back into a low ponytail, leaving a section free on each side. Wrap the sections around the ponytail for a pretty wrapped look. Here’s a similar twist-over ponytail for naturally curly hair. Combine a loose braid with a low ponytail for a look that works for a day with the kids or at the office. Create this lovely piece-y ponytail by adding texture to the hair, dividing it into three sections, and twisting them to form a low ponytail. Go for the vintage look with this super stylish retro ponytail. 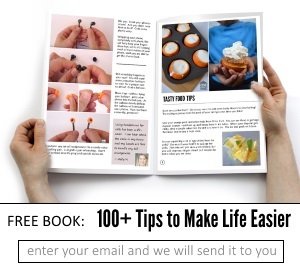 Watch the quick video tutorial to find out how to do it. Try a french braid and ponytail combo for a fun change of pace. The knot ponytail is quick and easy and works great for straight or curly hair. Get volume in your pony by teasing at the crown before pulling it up. For really long hair, you can’t go wrong with a sleek ponytail for a night out. This easy up-do is really just a tucked ponytail. Make a loose ponytail at the nape of the neck and tuck the loose end of your ponytail into the gap under your rubber band. Use pins to secure your hair. I have really thick, long hair, but this style will work for all different textures and lengths. I never and mean NEVER bother doing my hair. So I had to take a pic to document this moment. For a cute, everyday style, try the summer-perfect ponytail. So pretty! And don’t leave the kiddos out! Trying to tame your tot’s wild hair? Here are 17 terrific hairstyles for girls. If you are looking for a long-term solution to flyaways and protecting hair from damage, try this hair mask – it’s our favorite!! 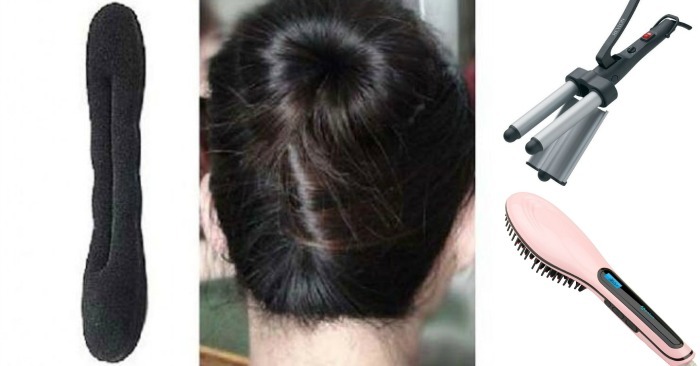 Bun maker tool kit is must have for every girl who loves stylish hairdos. Brush hair straightener. It’s a brush and a hair straightener. How cool is that! A Hair waver for the purpose of curling the ends of your perfect ponytails. P.S. We have fallen in love with the products of a new skin care line and have become distributors. If you love hair, love skin products *that actually work* and are looking for a side income, we have openings in our team!